I have been the victim of police misconduct and alleged criminal activities on a multitude of occasions. (see attached.) As such, I am seeking disciplinary action and criminal complaints against Lt. Sam Iacono, Patrolman A.J. McCarthy, Patrolman Jason O'Neil, and other unidentified officers. Band concerts, carnivals or other performances or similar activities publicly or privately sponsored and presented in any public or private space outdoors, provided that such activities do not occur between 11:00 p.m. on one day and 10:00 a.m. on the following day." At no time have I, nor any of my fellow performers, violated this ordinance. 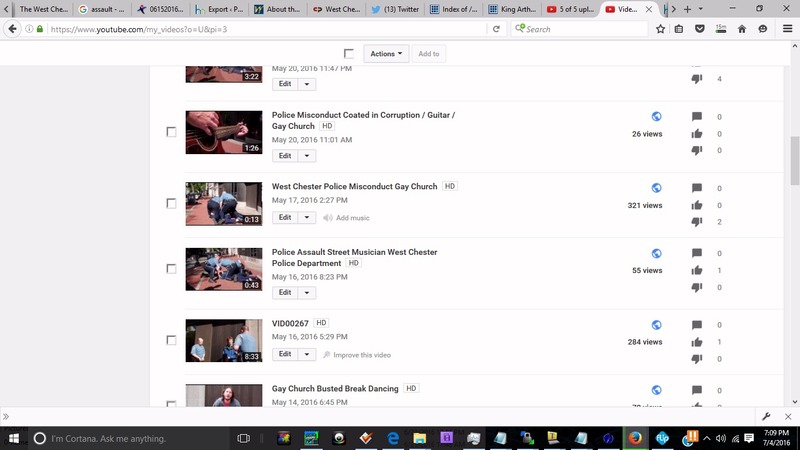 Nevertheless, I have been harassed, abused and terrorized by the West Chester Police Department under the guise of violating the ordinance. On the morning of May 21, 2016 my elderly parents' house was raided because I was a witness to the police officers' criminal activities. I seek immediate relief from the harassment, abuse and terroristic threats of the West Chester Police Department. "... I could see that (John) Messersmith agitated as he was very forceful in his answers and would glare at me. I requested another unit to assist me." "Messersmith remained silent but continued to stare through me." "I then asked Brouse if he recorded the entire incident and he stated that he did. I asked Brouse, who is known on the street as King Arthur, if he intended on posting the entire video."